Mueskes Landscape and Snow Management provides accurate & cost effective hydroseeding and sod installation services to give any property a fast growing and beautiful lawn. As a member of the International Association of Hydroseeding Professionals, we take pride in installing green and vibrants lawns for commercial and residential customers. 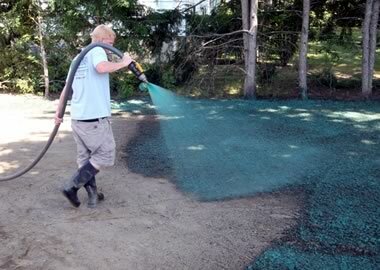 What is Hydroseeding? Hydroseeding is the process of combining seed, mulch, fertilizer, and healthy soil amendments with water to mix in a tank to form thick slurry. This slurry is applied with pressure to the surface for seed germination and turf development. Sod installation provides instant gratification and thick lush lawns, but will not last if it’s not installed properly. Our trained staff at Mueskes Landscape and Snow Management will ensure correct installation and satisfaction is guaranteed. We can help with a large variety of commercial landscaping services. Just fill out the quick form below with questions or to get a free quote! A properly hydroseeded and watered lawn will start to grow in about 7 days, and under normal conditions, will be fully established and ready to mow in 3-4 weeks.